In the interest of keeping track of where anything I commit to the web goes and what good it may be, I’m reposting my monthly messages to the Syracuse Astronomical Society (SAS) here. If, by chance, you find me first, are local (Syracuse), and have any interest in SAS activities, do drop a line. We’d love to see your featureless outline at our observatory this year. 2006 was a great year for observing around much of the world, or so I’ve read in newspapers and online. CNY weather dealt another tough hand this past year, leaving a small group of the most determined SAS members to be “on call” for much of the summer and fall, ready to rush to the observatory with hours notice to take in as much as our very clean and organized scopes and accessory boxes (from underutilization, of course) would allow. What few days (perhaps 25 memorable ones) we had included some wonderful sights, including 177P/2006 M3, or Barnard’s Comet, which serves as an important learning tool in early August for knowing exactly where in Hercules M92 and M13 are. At the very least, we’ve become more appreciative of the days we CAN get out to Darling Hill. 2007 started out equally dismal with an entire week of weather-interrupted viewing of Comet McNaught, of which the Scandinavians and certain Western US observers obtained phenomenal photographs that would have served as reasonable stand-ins for the ablaze Jupiter at the end of the movie 2010. We cross polarizers in the hope of better views to come. It is with no small bet-hedging in mind that the SAS meeting schedule has been changed from its usual “third-Friday” format to one that keeps the Friday meetings as closely tied to the New Moon as possible. The lunar calendar served humanity well for roughly 5000 years before this whole heliocentric model thing really took off and our NIST atomic clocks shifted our bookkeeping attention away from the night sky, so we hope Newton hasn’t lost his touch and we’ll have no full-moon surprises at the meetings. Part of the new schedule for Winter ’07 includes using the Space Science Series at the MOST as a proxy for the meetings that would have been at Ferrante Hall at OCC. This FREE series brings in Cornell astronomers to present publicly accessible talks about their research. 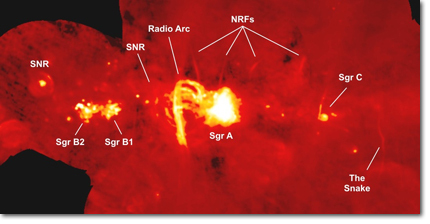 In the last meeting of 2006, Prof. Terry Herter gave a great talk on Galaxies and Quasars, from which the VLA-obtained filament images at the center of our galaxy were among the many highlights that help to reassure that at least some portion of our tax dollars are doing something profound. The next meeting (for the MOST and the SAS) is coming up quickly. February 8th (7:00 PM) features a talk by Prof. James Cordes on Radio Telescopes And The Search For Life In The Universe. You never know who, or what, will be in attendance. The Welch’s Sparkling Grape flowed like water at the Jan. 19th meeting, at which the following election results were obtained. Finally, you’ll note that the SAS website has undergone a significant overhaul (unless you forgot the previous one, in which case nothing has changed!) in an effort to make all of the site contents as front-accessible as possible. This includes a quick-look information panel for viewing at Darling Hill and a new banner identifying our membership in the NASA Night Sky Network, something I’ll be presenting in greater detail as part of the next SAS Message. The bulletin board remains the same, remarkably spam-free information center it has been for the past year. As part of the Syracuse University Symposium Series, an art show of Sky Charts from the 17th to 19th centuries are on display on the SU Campus. The show, “Celestial Images: Antiquarian Astronomical Charts and Maps from the Mendillo Collection” is on display until March 9, 2006 in the Shaffer Art Building. How often do you get to see an original Hevelius? Some of the SAS regulars plan on a group trip to view the collection. If you’re interested in joining the party, don’t hesitate and contact me.